Item is a letter from Julia Schmitt Healy to Ron Shuebrook concerning his omission from the Board of Directors of Eye Level Gallery. 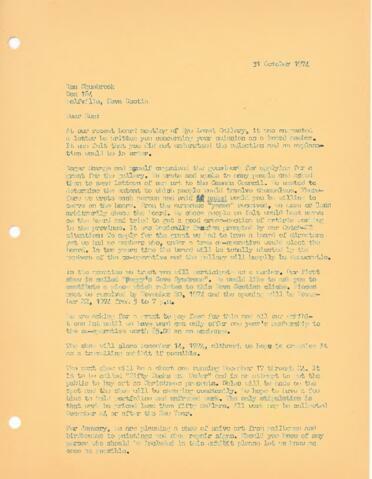 In the letter, Healy reveals that the selection process was "basically fascism prompted by our Catch-22 situation: To apply for the grant we had to have a board of directors yet we had no members who, under a true co-operative would elect the board." She invites Shuebrook to contribute a piece to the gallery's first show, Peggy's Cove Syndrome.